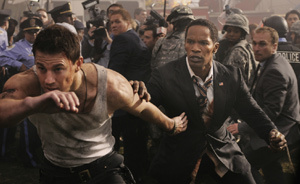 After the mind-numbing and wildly irresponsible Olympus Has Fallen, a movie in which a disgraced Secret Service agent saved the president from North Korean terrorists, comes White House Down, an action movie in which a wannabe Secret Service agent (Tatum Channing) saves another president — this one played by Jamie Foxx. The danger: A cabal composed of right-wing crazies, disillusioned military types and greedy corporations, some of whom want to wreak havoc with the nation’s nukes. First, a bit of housekeeping: This latest helping of mayhem from director Roland Emmerich (Independence Day) boasts a stronger than usual cast — at least for a movie that’s hellbent on dishing out overheated destruction. Included are Maggie Gyllenhall (as a Secret Service agent), Richard Jenkins (as Speaker of the House); and James Woods (as the retiring head of the Secret Service). I wish I could say that the presence of these veteran actors enriched a movie that begins credibly enough but quickly collapses into the debris of a ravaged White House. The plot of this violent PG-13 pig-out exists in a realm beyond stupidity and preposterousness; it can’t be described without spoilers, so I’ll simply say that trying to connect this movie to anything resembling reality is like trying to anchor an oceanliner with a thimble. The movie, I’ve read, is supposed to resemble Die Hard: It places violent action within the closed-space of the White House where Tatum’s John Cale — his daughter (Joey King) in tow — arrives for a job interview. King’s Emily is upset that her divorced dad missed her talent show, but she’s also totally immersed in White House trivia. She seems to know everything about the place. When the terrorist invasion begins, we learn more about President James Sawyer, who’s connected — via blatant suggestions — to President Obama. President Sawyer chews nicotine gum to combat his cigarette addiction and has lots of basketball sneakers in his closet, along with the obligatory black shoes. He owns a pair of Jordans. The major character disclosures are all fairly predictable, and it doesn’t take long for Emmerich to make it clear that he’s planning not only to stretch credibility but to torture it to the point where it’s screaming for mercy: A wild car-chase sequence on the White House lawn stands as a prime example, an attempt to mix action and laughs. Amid the explosions, you’ll find a budding bromance between Tatum and Foxx, who are thrown together as Tatum’s Cale tries to protect the president and rescue his own daughter. The girl happened to be in the bathroom when para-military fiends took control of the White House, entering as workmen hired to overhaul the sound system in the White House theater. Although Emmerich occasionally shifts the action to the plane on which the vice president (Michael Murphy) has been spirited away or to a headquarters outpost in the Pentagon, he sets about wrecking the White House with all the enthusiasm that derelict rock groups once brought to classy hotel rooms. Look, I have no problem with irreverence when it comes to the presidency or the White House, but I do have a problem with a movie in which we watch thugs put a gun to a child’s head and in which political ideas are tossed around as if they were nothing more than one-liners. Some of the actors take their work seriously; others, less so; and White House Down emerges as an atonal mess that seems to have invested a lot of energy into accurately recreating the White House — only for the purpose of ripping it to shreds.